This circuit proves that microcoprocessors, PCs and the latest ultra-accurate DACs are overkill when it comes to controlling four relays in sequence in response to arising control voltage in the range 2.4 V –12 V. By using equal resistors in ladder network R1-R5, equal intervals are created between the voltages that switch on the relays in sequence. Each resistors drops 1/5th of the supply voltage or 2.4 V in this case, so we get +2.4 V = Re1, +4.8 V = Re2, +7.2 V = Re3, +9.6 V = Re4. Obviously, these switching levels vary along with the supply voltage, hence the need to employ a stabilised power supply. Looking at the lowest level switching stage, when the control voltage exceeds 2.4 V, IC1 will flip its output to (nearly) the supply level. The resulting current sent into the base of T1 is limited to about 1 mA by R6. With T1 driven hard, relay Re1 is energised by the collector current. Because the BC548 has a maximum collector current spec of 100 mA, the relay coil resistance must not be smaller than 120 ohms. Nearly all current consumed by the circuit goes on account of the relay coils, so depending on your relays a pretty hefty power supply of up to 500 mA may be required. When dimensioning the ladder network to create the desired switching levels, it is good to remember that the 741 will not operate very well with input voltages below 1.5 V or above 10.5 V, while voltage levels outside the supply range (i.e., negative or above +12 V) are out of the question. If you do need a switching level in the range 0-1.5 V, consider using an LM324, which contains four opamps in one package. 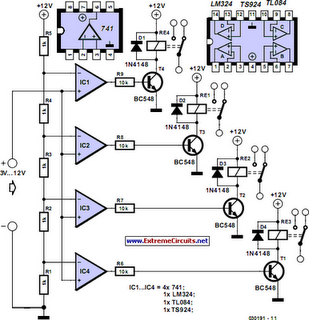 For the high side of the range (10.5 to 12 V), a TL084 or a ‘rail-to-rail’ opamp like the TS924 is required. However, the TS924 cannot be used with supply voltages above 12 V.